As a young Army soldier, Alexander Smoot leaves his struggling mother in order to pursue his dream of climbing the ranks in the military for the glory of himself, his family, and his country. Unbeknownst to him, the Great Depression and growing destabilization in Germany is causing the military to be inundated with men in need of careers. 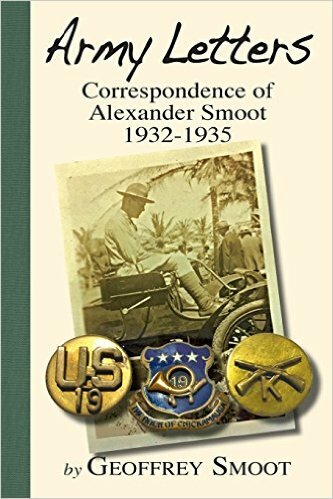 The issue is summed up succinctly by Smoot as he writes to his mother upon his discharge, "You can get so far up the ladder and there you'll remain, [a] sort of outcast to the civilian population." Although this story is told through Smoot's letters, the reader gets an idea of the family he left at home. His mother and siblings are experiencing their own hardships that Smoot desperately desires to aid them with, however, he can't seem to gain any financial leverage during his stay in Hawaii. As expenses pile up with each paycheck, Smoot realizes the unfortunate reality of his coming of age experience – there isn't much for him except the monotonous routine of the Army. Far from being despairing, the reader has the opportunity to laugh at funny situations and lighthearted commentary by Smoot. Attempting to lighten the mood in his notes home, he repeatedly reassures his family that all is well and enjoys sharing details of the silly antics of his companions. With a writing style that allows his letters to convincingly be placed in a book format, Geoffrey Smoot, the son of Alexander, shows his ability to notice a story worth sharing. Although the letters are clearly written in a time when such language was allowed, as mentioned in the preface to the book, there are a couple of sections that refer to a specific lynching incident and the language utilized regarding the men of color is shocking and may cause discomfort amongst certain readers. A fascinating and true look at the life of this particular soldier's experience of the military a few short years before Hawaii would be ravaged by the beginnings of WWII. Army Letters is an excellent read for anyone interested in historical non-fiction especially those with a particular interest in the environment prior to WWII. Geoffrey Smooth is Alexander Smoot's oldest son. Publishing these letters is related to his desire to preserve his father's legacy but also to offer an opportunity for students of history to have a firsthand prime resource which would enable a better understanding of what individuals and families endured during these challenging times. Geoffrey is a retired history teacher, B.S. Ed. Penn State (1966), and a Master's from Salisbury University (1972). He served four years in the U.S. Coast Guard (1958-62) as an Aerographer's Mate before attending college. He was a longtime baseball coach at Bennett High in Salisbury, MD. Married (Beverly) with two sons, a daughter, and four grandchildren. Currently retired, he is active in his church and also in community concerns.